I’ve always been a fan of Stephen King’s work. His books and short stories are enough to fill a library, and he’s done more work in television and film that any other novelist I can think of. I’d love to sit down and have a cuppa with him one day, and it’s not entirely implausible; he lives in Maine not far from where my parents have an old brick schoolhouse they converted into a home, and frequents the same diner counter my dad loves. They’ve sat together over fried eggs and hash browns to shoot the breeze before — trust me, the unlikely and cool are not uncommon to JaxDad’s life. My parent’s home in Maine is at the top of a hill with a relatively steep slope, with a small reservoir at its base. A beaten and broken, virtually antique truck used to lie near the reservoir, and King once penned a story about it. My parents took a photo of the truck as though it were a celebrity, framed it along with the story, and placed it next to the big blackboard they preserved in the schoolhouse’s main room. A few years ago, JaxMum had the photo copied, enlarged, and framed for JaxBro and I, who liked to climb on the truck and peer into its glassless windows. My copy is hanging in our library, not far from several King tomes — It, The Dead Zone, Salem’s Lot, Four Past Midnight, Thinner – which was originally written under the name Richard Bachman. King inspired movies can’t be discounted, either. Misery, The Shining, Dolores Claiborne, Carrie … all classics of cinema, not just horror flicks. 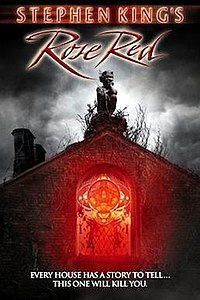 I’m also a fan of the 2002 TV mini-series Rose Red, the tale of a ravenous mansion and the psychics trapped inside. King wrote the screenplay for the film, and appears in a hilarious cameo as a pizza delivery guy. It’s also supplemented by a cool fiction-reality cross-over endeavor. A companion book — The Diary of Ellen Rimbauer, (referencing one of the movie’s main characters) — was published as written under the name of yet another character in the film, Dr. Joyce Reardon. Confused yet? You’d think The Diary of Ellen Rimbauer was written by King, but nay. It was actually written by Ridley Pearson. It’s a good read (and a great October Book), a sort of prequel to Rose Red; so naturally, it served well as a follow-up made-for-t.v. movie. Like King, Pearson, too, made a cameo appearance in the flick, and challenged fans to e-mail him with the total number of times he appeared on screen. I shot him a line, and a few weeks later, I guess my horror-nerdiness paid off – I received a signed, hard-cover copy of The Diary of Ellen Rimbauer (I’d already read it in its soft-cover version, so the new book went right to the signed-copy shelf on my bookcase for preservation). Toast, coffee, and bacon with Stephen King at the diner next to the general store, it was not. But another interesting wrinkle to add to the King influences in my family’s life? Sure. I am not a bit surprised to see this as your article so close to Halloween. Auntie would have been very proud. I am sure one day you will sit at the counter and have toast, coffee and bacon with him.